Te Papa Research Fellow Patrick Brownsey was recently contacted about a population near Levin of the very rare Ophioglossum petiolatum. Ophioglossum are odd looking ferns, as befits a common name of “adder’s tongue ferns”. 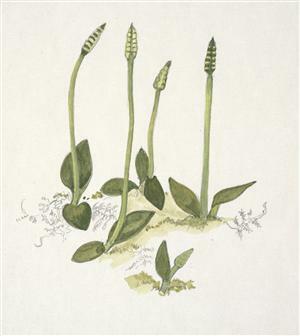 We don’t have a picture of O. petiolatum (stalked adder’s tongue fern), but the related O. coriaceum is similar; O. petiolatum has a rounder leaf and a longer fertile spike than shown in the drawing below. Ophioglossum coriaceum. Adams, Nancy. Purchased 2006. © Te Papa. Ophioglossum petiolatum has a Nationally Critical conservation status in New Zealand. More details and photos from the Plant Conservation Network. Pat saw the Hokio population about 30 years ago, and wrote an article about it. A local landowner wanted to know if the population still persisted. Primary Science Teacher Fellow Wendy Hogg and I joined Pat for the hunt, but we were unsuccessful. The area is much changed, and it seems unlikely (but not impossible) that O. petiolatum survives near Levin. 1985 article about Ophioglossum petiolatum at Hokio (2.3 MB pdf). However, we did find the unusual, floating liverwort Ricciocarpos natans. Although only a centimetre or two across, it is very distinctive. It has a Nationally Endangered conservation status, but it is probably under-collected, and may be more common than appreciated. Please look out for it amongst the “duckweed” on your local ponds! The floating liverwort Ricciocarpos natans. Here it is ‘beach-cast’ in mud, along with Azolla rubra (a floating fern; the red plant in the lower-right corner) and Lemna duckweed (the small green ovals). Photo Leon Perrie, © Te Papa. The wetland at the mouth of the Hokio stream was drained in December by a stream diversion. 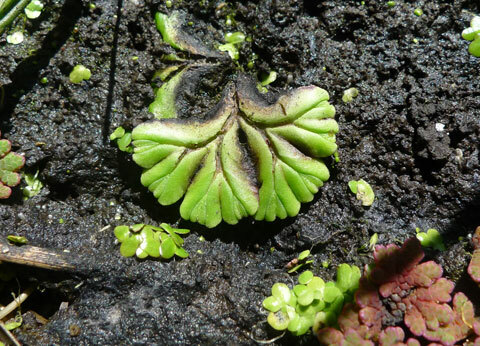 Was the floating liverwort found in the wetland? Where we saw Ricciocarpos was a couple of km from the Hokio stream mouth. I do not know if Ricciocarpos occurred in the Hokio stream mouth – I haven’t looked there, and there are no specimens from there in Te Papa’s collections. No, as far as I can tell, the Ophioglossum petiolatum was seen a couple of km to the south of Hokio Beach township.